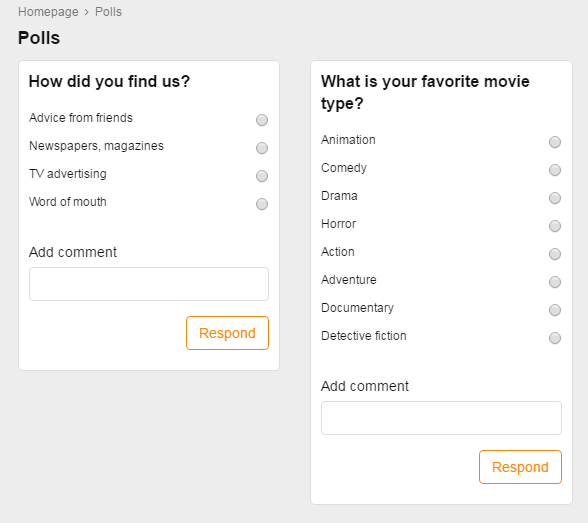 The Polls module serves the purpose of asking your site guests and members different questions, for example ‘How did you find us?’ and others. Multiple languages are supported which means that you can translate both the question and the answer options into all available site language versions. 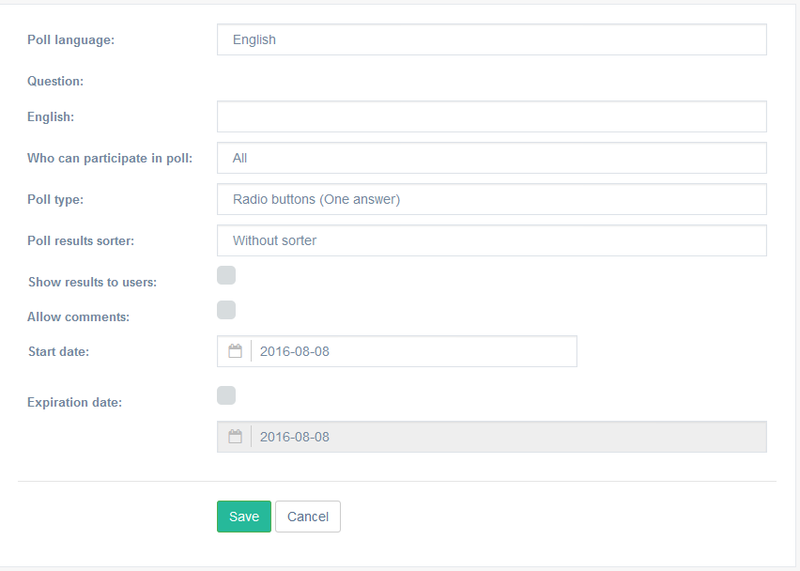 Your admin panel options include creating/editing/deleting polls, modifying answers and checking the results of the surveys. Create a new poll by clicking Add poll. 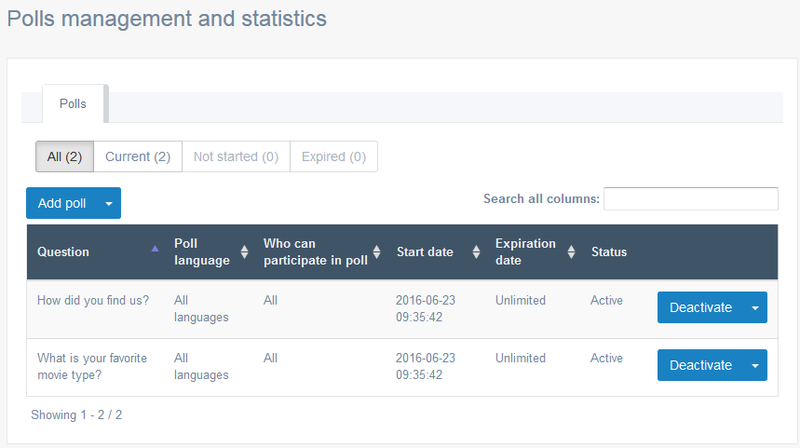 Poll language: select the language that the survey will be available in. Be advised that it won’t appear in the English version of your website if a site visitor switches to the German version. You can choose ‘All languages’ and translate question and answers into the active site languages. Who can participate in poll: select user types. Poll type: one answer or multiple answers. Poll results sorter: display answers in ascending or descending order depending upon the number of votes. Show results to users: if checked, will show the results after the vote is added. Allow comments: allows the users to post comments to the survey. Useful when your poll needs extended answers. Start/Expiration date: leave expiration date unchecked to let the survey run indefinitely. Fill in all the details and click Save to gain access to the next menu. 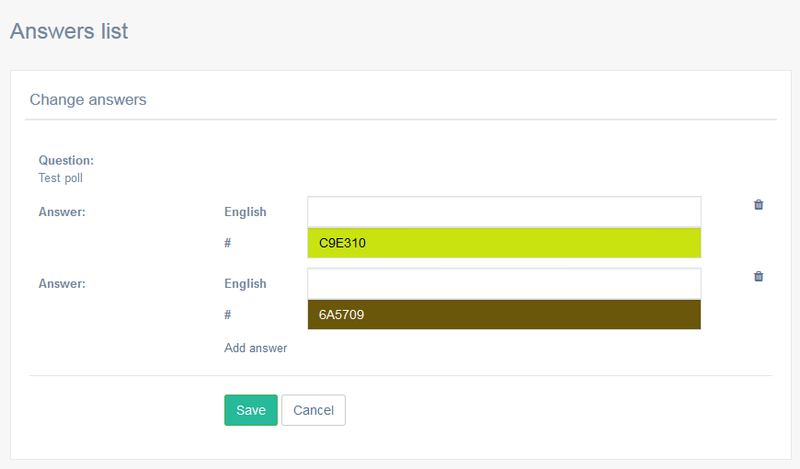 Fill in the answer options and decide on the color of the progress bar. Click Add answer if you need more options to add. Please note that you will not be able to edit answer options once somebody takes the poll. Otherwise the poll results would no longer be valid.